I’ve been on a Gundam kick lately. It seems like every once in a while my reading and TV watching habits get directed to a particular series and I immerse myself in it for a few weeks. Back in May I had a Star Wars kick where I was reading and watching a lot but it’s since died down and now I’ve moved on to other things. 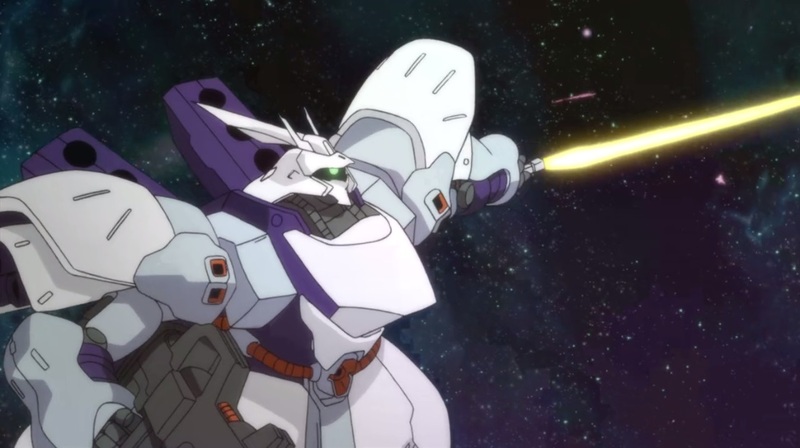 I’m been reading Anne McCaffrey’s Dragonriders of Pern series but when I’m not in that book, I’ve been rewatching some of the Gundam series and learning new things about the series. I’ve discovered the world of Gunpla, a portmanteau of Gundam Plastic model kit. This is, in short, a whole different genre of Gundam fandom that I was, at best, marginally aware of before. It turns out it’s a hobby that is as old as the Gundam franchise. I’ve just ordered my first kits the other day and while it’s something I would like to blog about, I’ll have to wait until the kits have arrived and I’ve built them to do so but for now, I’d like to review a delightful Gundam OVA called Model Suit Gunpla Builders Beginning G.
The show was created in celebration the 30th anniversary of the release of RX-78-2 Gundam, the first ever Gunpla. Since then, Gundam model kits have been as popular a hobby as watching the anime has been. The idea to create an Original Video Animation (OVA) series that would focus on Gunpla builders is an inspired idea. It’s anime metafiction and the idea to celebrate Gunpla, which is itself inspired by a franchise which began with an anime series, by making an anime of its own is a neat way of combining both elements of fandom. It just makes sense. It’s also surprisingly good. The battle cockpit! It's very lifelike and I think it works well as a simulation. The plot is very simple, and it needs to be because as most OVAs, Gunpla Builders Beginning G is a very short series. Comprised of 3 episodes that amount to approximately 40 minutes of television (if you don’t count the opening sequences and the end credits), the series doesn’t waste its time. A teenager named Haru Irei is visiting the 1/1 scale RX-78-2 in Odaiba, Japan (a real life size model) with his father and his friend, Kenta Sakazaki. Haru is noticeably awed by the majesty of seeing a life sized Gundam model and his father suggests they buy a model kit at a nearby stand. Kenta is enthusiastic as he’s a Gunpla builder himself. Missing out on grabbing the last kit of a 1/144 High Grade RX-78-2 Gundam Ver. G30th, Haru ends up bringing home a GPB-X80 Beginning Gundam model kit home, hence the title of the series. So far the numbers and names of the kits seem pretty confusing, especially to newcomers, but for viewers who are familiar with Gunpla it will all make sense. Thankfully, it’s not necessary to know the ins and outs of Gunpla to enjoy the show. Besides, since the series is based on a real-world hobby, viewers can search online for any answers to any questions they might have on Gunpla building. So far everything in the show is a dramatization of what could have been someone’s real life experience but because this is a Gundam series, it’s not complete until there giant robot action. In the anime universe, Gunpla builders can partake in virtual battles in which they pilot the very same Gunplas they build. One of the downsides of the show is that its short length doesn’t give it nearly enough time to develop characters. Haru is the typical hero and his character arc is predictable. In a single year he goes from complete novice to achieving the rank of Gunpla Meister. My favourite character is Kenta, his best friend. He’s just incredibly supportive and non-judgemental. He’s just happy to see his friend happy and to share a hobby he loves. Unfortunately, Rina, the female friend, is woefully underdeveloped and she’s a poor character overall. She’s focused on how cute she can make her Gunpla and is seemingly unaware of anything else related to the hobby. She acts like quite the airhead and she only starts to show her capable side in the last few minute of the show. There’s nothing wrong with liking things that are cute or being goofy but that’s all we see from Rina and it makes for a one dimensional character. Likewise, the antagonists are pretty lame and one of them even rides around on a horse. Why? Who knows but it’s really lame. I was pretty impressed with how much information the show provided about the Gunpla battles, most of which was done via character exposition during the battles. 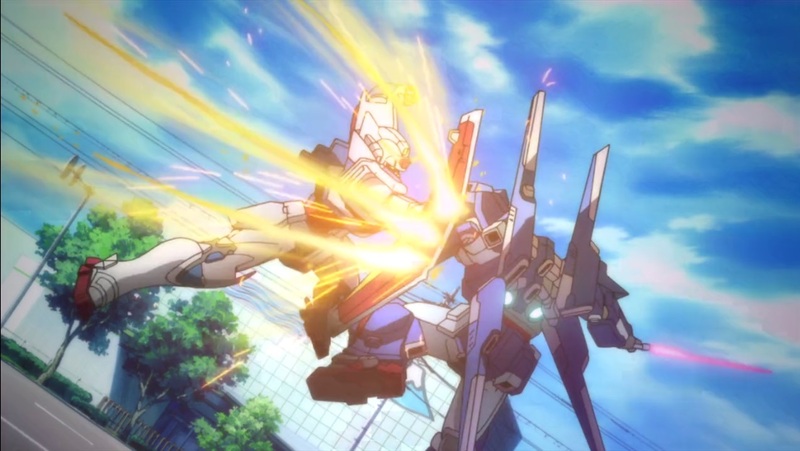 There are a lot of rules and information to know about the Gunpla battle simulations. Things such as the scale size of your model count for how big it will appear in the simulation. Kenta’s 1/144 size mobile suit fights against a 1/550 and it’s hilariously tiny. The quality of the build also matters. A Gunpla that wasn’t assembled well will be weaker and more fragile than an expertly build mobile suit. Additionally, fragile or hastily added customization will result in a weaker Gunpla. The most surprising aspect of Gunpla battling is that the model matters more than the pilot. Sure, without any piloting skills you will be useless in battle but even an inexperienced Gunpla builder like Haru can beat an experienced opponent because his Gunpla was built with care. Likewise, Haru is nigh-invincible in the last battle but it’s not due to his growth as a pilot, instead his mobile suit’s newfound power is the result of adding new parts to his Beginning Gunpla. 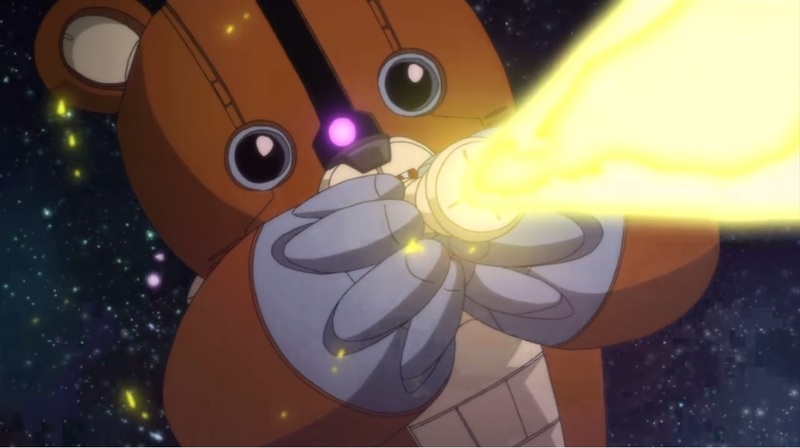 Bearguy's flute beam. Yup, you read that right. To say any more about the show would spoil it, as I mentioned it’s very short but in its short length, it manages to include quite a bit of story and an impressive amount of action. The graphics are very good and the battles are good too but they’re too quick and unless they feature the main characters they do not provide us an insight as to what the pilots are doing. It’s literally just robots destroying each other and that’s a shame because losing the human element (especially in a show where the pilots built their own models to battle with) is unfortunate. Sure, these battles are very short and are probably there to display mindless action but the very presence of mindless actions diminishes the quality of the show by diminishing the show’s themes. 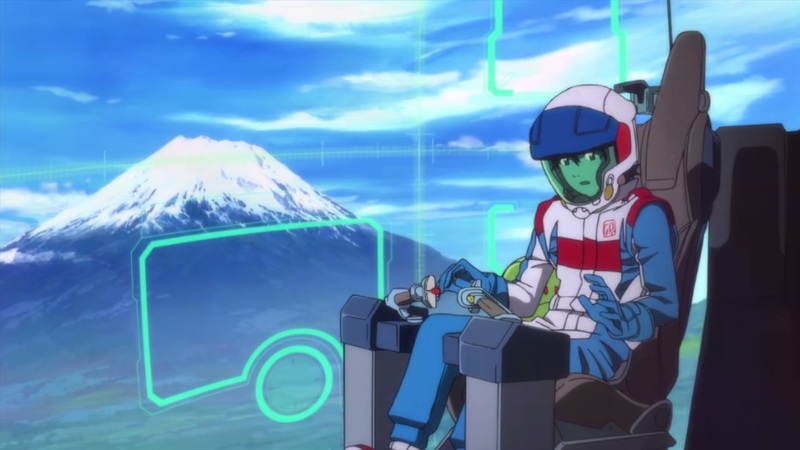 Naturally, shows like this only exist to try and grow the fanbase for the Gundam metaseries and Gunpla building. It’s very commercial and it would have been so even if Bandai didn’t release a new grade of Gunpla models, called the HGBC or High Grade Build Custom, shortly after the OVA's release. The new grade of models as well as this OVA broadcast a few philosophies about Gunpla building and I’m sure it is something that real world Gunpla fans can relate to. Mostly, it’s about having fun and enjoying the creative process. It’s also important not to worry about screwing up. 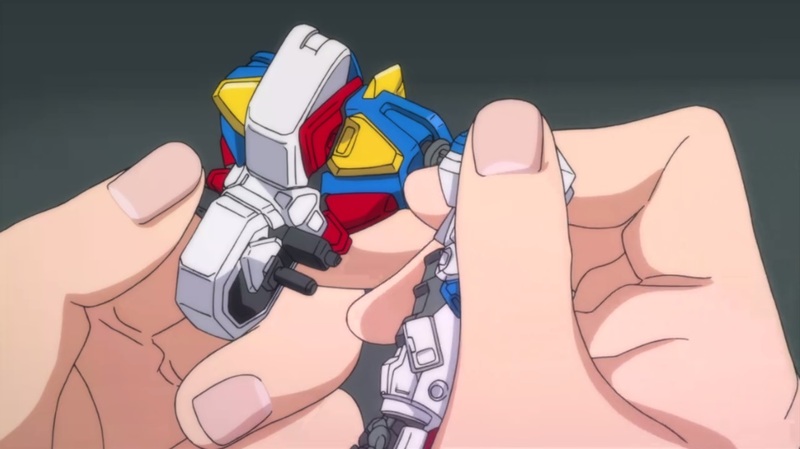 You can always disassemble your Gunpla and smooth out the kinks. Aside from breaking a piece, you can fix most anything else. Customization is also another way to have more fun with your Gunplas. Overall, it’s a very enjoyable 40 minutes of television. The show packs quite a bit of story and action in so few episodes. I’d prefer that as show try and condense as much story as possible in each episode than something that drags on and on. I think we have plenty of 40+ episodes Gundam series, it’s refreshing to see something so self-contained. Yet, it shouldn’t come as a surprise that the concept of this OVA series was developed into a full fledge series made up of two 25 episode long seasons, the first of which has already aired. It’s an intriguing idea and I’m excited to watch Gundam Build Fighters.